Philippine Psychometricians Licensure Exam Reviewer : Practice Quiz Links: Personality, Abnormal, Organizational Psych, etc. Practice Quiz Links: Personality, Abnormal, Organizational Psych, etc. Psychology, published in association with the British Psychological Society, is the definitive introductory textbook for students starting their study of psychology. "Comprehensive, engaging and incisive - this is an outstanding text that students will be sure to welcome." "This is an extraordinarily comprehensive text. I have not seen anything to equal it in terms of sheer depth and breadth of coverage. Fortunately, the logic of the structure and the clarity of presentation permit this mountain of information to be easily navigated by the student." "This is the best introductory psychology text I have seen. The text is well written and comprehensive and, unlike some other introductory texts, it treats topics with the intellectual rigour they deserve. 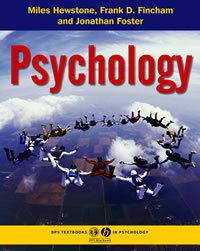 I would not hesitate to recommend this book to anyone teaching introductory level courses in Psychology." "This book does a great job in providing a comprehensive, integrated, state-of-the-art coverage of the field of psychology, it really brings the field alive. The chapters are clearly structured, written in a highly accessible style and full of fascinating information. Each chapter is authored by a leading expert of the respective area. The authors succeed in conveying their fascination with their fields to their readers. The book is a pleasure to read. Students will not only profit greatly from reading it, they will enjoy doing so." "Preparing an introductory psychology text requires difficult decisions about the desirable range of subject matter and depth of treatment. Hewstone, Fincham and Foster have assembled a number of editors, all of whom are experts in their fields to assist with this task, and have used a framework which makes the material accessible and coherent."